Local Power Plant Gets Carbon Tax: The Montgomery County Council passed a carbon tax bill May 19, which will impose a $5 tax for each ton of carbon dioxide produced by companies that produce more than 1 million tons of carbon dioxide each year. Mirant is the only such firm in the county; its Dickerson power plant produces 3 million tons of CO2 a year. Yes, DC, your water did have lead in it: The Washington Post’s Robert McCartney wrote a column May 23 about Marc Edwards, a Virginia Tech environmental engineering professor who for six years challenged a report by the Centers for Disease Control and Protection. He was vindicated May 21 when the CDC published an admission in an official weekly bulletin that it had misled the public about the risk of lead in the city’s drinking water in 2004. Tuesday, May 25, 7-8:30 pm – Filmmaker Chris Palmer will talk about his new book, “Shooting in the Wild: An Insider’s Account of Making Movies in the Animal Kingdom,” published by Sierra Club Books. He’ll also show clips from his wildlife films. Palmer is director of American University’s Center for Environmental Filmmaking. Event takes place at Bethesda Green, 4825 Cordell Ave., 2nd Floor, Bethesda, Md. Thursday, May 27, 7:30 pm – ReThink Montgomery — A. Michael Schaal, Director of Energy Information Administration’s Oil and Gas Division, will discuss energy and sustainability at Park and Planning Headquarters, 8787 Georgia Avenue, Silver Spring. 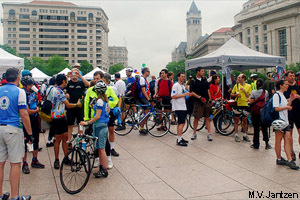 Living in Bethesda for over 40 years, I have become an avid cyclist. There is no better way to get around. It is quicker and cheaper, has no parking problems and I enjoy the exercise. Also there are lots of other psychological benefits: I get to slow down, get a feel of the community and lessen my environmental impact. As an expert in used oil recycling, I also believe in another type of “re-cycling”; this is why biking is my thing. Also I have documents showing the numerous water impacts cars have on the Little Falls and other area watersheds. Commuting by bike reflects the tenor of the times because of its health benefits and low environmental impact. Biking to work or using a bike to run errands prevents pollution, saves you gas or transit money, and benefits us all by reducing oil and gas use. Biking also can be less stressful than hanging out in area traffic. Riding a bike can give you fresh air outside the gym and allow you to see more of the outside world. Also you may consider taking a bike to the subway or to the bus stop. There are many wonderful ways you can explore neighborhoods and get a sense of our beloved Bethesda community pedaling around. Increase everyone’s quality of life here: Bicycle as much as you can! Change is blowin’ in the wind: Last week, American University announced it has purchased 100 percent wind power through wind-generated renewable energy credits. The credits are equivalent to AU’s annual electricity usage of 53 million kilowatt hours. Among local colleges, only Catholic University has also purchased green power. One local who is promoting wind power is Mike Tidwell, head of the Chesapeake Climate Action Network. In an op-ed in the Washington Post, he urges Virginia to drop its offshore oil drilling plans and instead build offshore wind turbines. Local blog AwesomeDC.com notes that the Finnish Embassy now features a banner saying it is green—the first LEED certified green embassy in DC. Apparently they got the status back in February, according to their website. May 20, 7:30 p.m — ReThink Montgomery Speaker Series – Kate Herrod, Director of Ashoka’s Community Greens, will discuss effort to enhance communities by integrating citizen-managed shared green spaces into places where people live and work. M-NCPPC Auditorium, Ground Floor, 8787 Georgia Ave. in Silver Spring. May 20 and 22 (10 a.m. – 1:00 p.m. both days) — Conservation Landscaping Techniques Workshops, one session, given twice by the county RainScapes program. Learn how conservation-based landscaping techniques can beautify your yard and neighborhood, restore native habitats, and help improve the environment all while saving you valuable time and money. Explore ways to replace traditional lawns with native landscapes to benefit out local streams and the Chesapeake Bay. $10. Takes place at Brookside Gardens. May 22, 9:00 to 1:00 — Second Annual Volunteering for Business Day at THE BUTTON FARM. Help prepare soil for planting, plant seeds, stack wood, clear trails, create signs….there is something for everyone and every bit helps! The Button Farm is run by the Menare Foundation, which is a Bethesda Green incubator organization! Location: 16820 BLACK ROCK ROAD, GERMANTOWN, MD 20874. Get More Event Info from the Corporate Volunteer Council of Montgomery County. Do you have more news or events? Post them in a comment here! Tonight there will be a free workshop in Environmental Site Design–the new norm for stormwater management in Maryland–from 7 to 9 p.m at the Audubon Naturalist’s Society’s Woodend campus in Chevy Chase. Two D.C. business partners plan to open five Yes Organic Markets in low-income areas in D.C., including neighborhoods east of the Anacostia River. Whole Foods Market will open a new store May 18 in Friendship Heights with a bread-breaking ceremony at 10 a.m. The store will host a Spa Night on May 20, featuring free facial treatments by Skin Organics founder Ann Webb. The store will be at 4420 Willard Ave.
Michael Shuman will discuss community economics at the ReThink Montgomery speakers series, Thursday, May 13 at 7:30 p.m. He is Director of Research and Economic Development for the Business Alliance for Local Living Economies. The talk takes place at Park & Planning headquarters, 8787 Georgia Ave. in Silver Spring. Poolesville approves renewable energy sources and a farmer’s market. Ground- and roof-mounted solar energy systems and loop geothermal systems would be permitted on all properties. Small wind energy systems would be allowed in certain areas. Got more news? Post it in a comment! There have been quite a few green stories in the news during the last week or so. Here’s a quick rundown of things we’ve seen. We plan to make this a weekly blog feature, so check back regularly to get your dose of local green news. And if you see something we’ve missed, post it in the comments! Bethesda Green co-founder Seth Goldman is in this month’s issue of Washingtonian as one of the magazine’s Green Awards winners…For local foodies there’s a new cookbook, “Dishing Up Maryland: 150 Recipes From the Alleghenies to the Chesapeake Bay,” by Lucie L. Snodgrass. The book follows the seasons, includes profiles of Maryland farmers and watermen, and each recipe features at least one local ingredient…Washington Post columnist Robert McCartney wrote an excellent column about changing how we view our lawns, “Redefining the beautiful lawn when it comes to the Chesapeake Bay’s health”…The Post also profiled 3greenmoms, a Potomac company that created LunchSkins—dishwasher safe bags made from pastry bag fabric—as a green alternative to single-use plastic lunch bags…And last weekend the Post ran a story about a net-zero house (and its new owner) in Bethesda; the house was designed by Meditch Murphey Architects of Chevy Chase.